The Buick LaCrosse is being discontinued in its home market, but elsewhere it's doing more than just soldiering on. In fact GM's quasi-premium brand just rolled out a facelift for the full-size sedan, designed specifically for the Chinese market. And looking at its rather handsome lifted face, we can't help but be a little jealous. The updated LaCrosse (pictured in the two images below) benefits from a new grille with a horizontal mesh and a chrome frame that extends to underscore slimmer LED headlights. And the front bumper has a more upscale look. The tail end has been reprofiled as well, with sharper-looking taillights, a chrome strip extending beyond the full width of the trunk lid to incorporate the badge at its center, and dual stylized exhaust tips at the bottom. We've yet to see what it looks like inside. But under the hood, Buick has slotted the new 2.0-liter turbo four from the Cadillac XT4, producing 237 horsepower and 258 lb-ft of torque, and mated to a nine-speed automatic transmission. The enhancements stand to further cement the place that the LaCrosse has taken in the Chinese market, but evidently couldn't secure back home. Though quintessentially American, the Buick brand has become a far bigger seller in China than it is in the United States. So much so that some have opined that GM only keeps it around to serve the Chinese market, which might not buy into its American character if it were phased out back home. Last year (as in the past few prior) Buick sold over a million vehicles in China, but only a couple thousand in the United States. Of those, the LaCrosse accounted for nearly 70,000 in China, but just over 15,000 in the US. 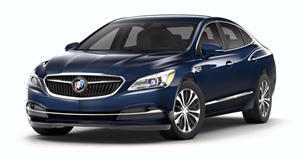 The Buick LaCrosse is the automaker’s entry in the full-size sedan market that exhibits limo-like qualities.